Accumulating dust in the corner of my counter top, I reluctantly pulled my slow cooker forward with “The Italian Slow Cooker” by Michele Scicolone in hand. My crock-pot once was my treasured appliance, but over time, the meat was getting too mushy and catching in our teeth and so it lost its position of glory. With my passion for cooking Italian, I often seek new cookbooks to inspire. It is gratifying to discover new dishes that bring my family back for seconds. At times, an author even teaches me how to make a staple in our household “better.” In addition, I find it irresistible to tweak recipes and improve them. Accordingly, when I perused The Italian Slow Cooker, I was motivated to attempt some appetizing Italian meals without laboring over the stovetop. Polenta has come into play for my family, because of my son with autism and his need for gluten-free. He loves fried polenta dipped in our homemade marinara. Michele Scicolone is a best-selling authority on Italian cooking, teaches cooking and wine-tasting classes around the world, and leads culinary tours in Italy. Additionally, she is Co-Food and Wine Editor of i-Italy.org. Michele first gives instruction on the pros and cons of slow cookers and choosing one, followed by the golden section on Techniques and Tips. Do not skip this section! I cannot agree with her more about first preparing your aromatics on the stovetop, something I failed to do in the past when I used my crock-pot. To boot, she explains why browning your meat beforehand gives flavor, texture, and color. I will not put meat into my slow cooker without browning and seasoning it first. Next, Michele covers safety to prevent many varied issues followed by a chapter on stocking the Italian Pantry, which is very useful to a novice Italian cook. I will cover more on the Italian Pantry from my perspective in another article, so as not to digress. Not only do I appreciate Michele’s recipes, but also she gives serving suggestions, which really helps me comprehend how to utilize a dish I have never cooked before. Many times I am dissuaded to undertake a new recipe if I have no idea what to dish up alongside. In addition, Michele teaches food-styling classes which is evident in the photos of this cookbook. Pictures of the dishes whet my appetite. or use liners for easier clean-up. 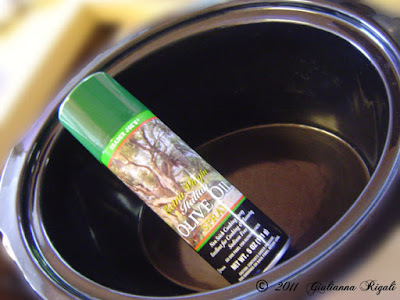 The one thing I do not find Michele mentioning in her cookbook and possibly she does not advocate; I spray my crock pot with an olive oil aerosol (non-stick spray) before I use it. It has made cleaning up my crock-pot so simple now, whereas it was a dreaded chore. 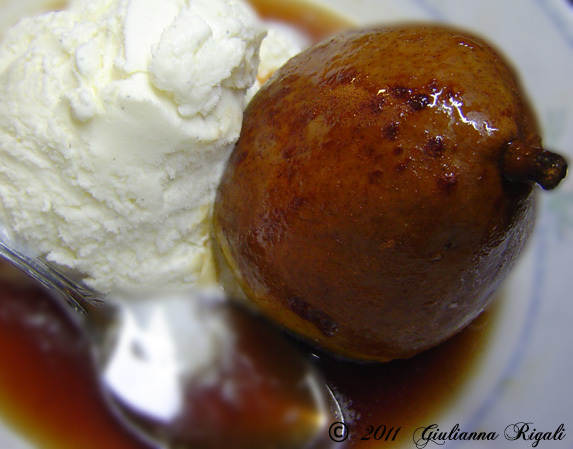 The slow cooker does not work for everything, but you will be amazed at how many Italian dishes and desserts you can prepare in it and they do come out scrumptious. In The Italian Slow Cooker, Michele instructs on soups, sauces for pastas, risotto, polenta, grains, seafood, eggs, chicken, turkey, beef, veal, pork, lamb, vegetables, dried legumes, and desserts. The stovetop dishes that require massive amounts of stirring such as polenta and risotto are now simple. I can write an article while the polenta is babysitting itself! I prepared several of the recipes from this cookbook and was delighted with the easy preparation and scrumptious flavors. I believe most cooks will be elated with this cookbook and the time it will free up for them to accomplish other things. I assembled the Chunky Pork Shoulder Ragu (click link to view recipe). I often buy pork roasts, but the desire to use them in ragu was lacking. It turned out so hearty and tender without becoming mushy. The flavors were a perfect combination. Michele suggests serving it with hearty pasta like rigatoni or on polenta. We tried the latter recipe, Polenta with Pork Ragu. Having leftovers, I made panini (sandwiches) with the pork, a little of the sauce, mozzarella, fontina, and fresh basil spread between two slices of Italian bread swabbed in Olive oil and cooked in the oven until the cheeses melted. It hit the spot. If you don’t like the inside of your bread soggy, I would recommend you first put the bread under the broiler to brown it a bit, then layer the bread with the cheeses and put the sauce and basil between the cheeses, before returning it to the oven to bake. I was delighted to learn an easy technique for making polenta. It cooked beautifully and turned out creamy. It was so uncomplicated. Yesterday, I primed the Pears in Marsala recipe from this cookbook. Something about the combination of flavors in the sauce, in the beginning, concerned me that it was not going to be very good. The scent did not appeal to me. However, after an hour of baking, the spicy scent filled our home and we could not wait for the pears to finish cooking! My palate distinguished the sauce as delectable. Michele has earned my trust, as she is an excellent chef. She has a superior discernment on which ingredients will merge to make a dish delicious. Now when Michele speaks, I listen with the greatest respect. Next in my slow cooker, I cannot wait to engage her Sicilian-Style Orange Chicken recipe! 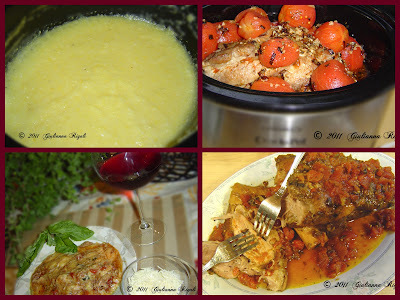 *Photos of The Italian Slow Cooker and Michele Scicolone are from her personal website. Copyright (c) 2010 by Michele Scicolone.